This is a new tool released from CPUID website. 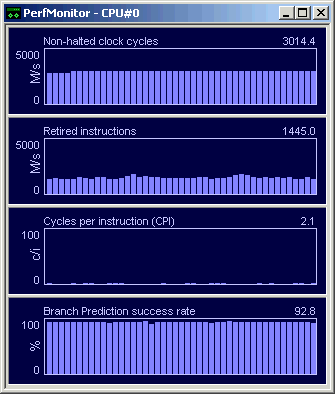 PerfMonitor is a processor performance monitoring tool, which allows users to track the frequency of 4 events choosen in a set of model-specific list. as a hardware-level CPU comparison tool, comparing the key parameters of different CPUs runnning the same benchmark. PerfMonitor 1.0.0.5 can be downloaded from this link. Note that, you will need Administrator rights to run PerfMonitor, if you are running Windows XP/2000/NT4/Vista systems. This entry was posted on Tuesday, April 18th, 2006 at 4:29 pm and is filed under Utilities, Windows . You can follow any responses to this entry through the RSS 2.0 feed. You can leave a response, or trackback from your own site.